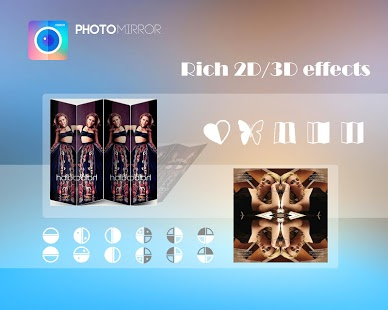 PhotoMirror is the best Mirror effects with tens 2d mirror effects, tens 3D mirror effete, tens memento Designed Mirror effects, almost hundred photo collage effects! 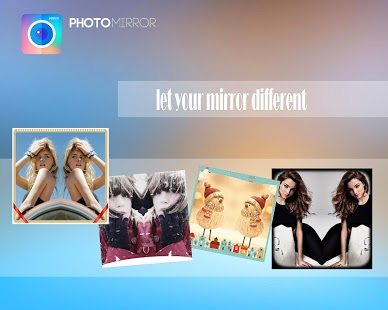 More than ten million people use PhotoMirror now, just join and enjoy it! 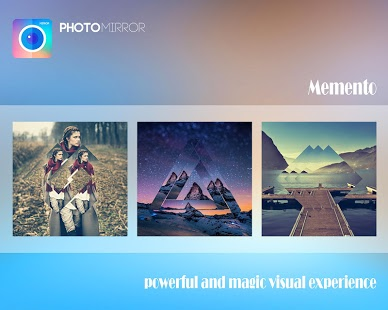 PhotoMirror allows you to create mirror reflection effect for your photo or image, and collage best effects with you photo or image.You can create left-right, up-down, reflection, repeating as well as reflection style enabled photos with this photo editor app. Furthermore you can apply lots photo effects and designer photo frames to these mirror photos for making them more attractive. PhotoMirror also allows you to create memento mirror reflection effect for your photo or image. Just one tap, you can create shadow, pip, multicolors, loves, 2015 and so on designed memento effect. Tens effects make you friends of Facebook,twitter,Instagram and so on just only like you! PhotoMirror also allows you to create 3D Mirror effects, with heart, love, bat, leaf and so on. 3D Mirror effects is loved by more and more people, and we are pro void more effects for who like it! PhotoMirror also allows you to mix several photos together, that's photo collage, which allows you to merge up to 9 photos together! 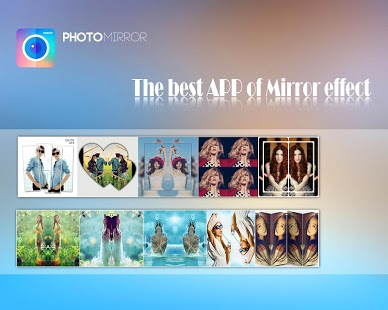 Mirror photo is an easy-to-use and powerful photo editor and photo collage! PhotoMirror remember every moment of you life with the best record style. 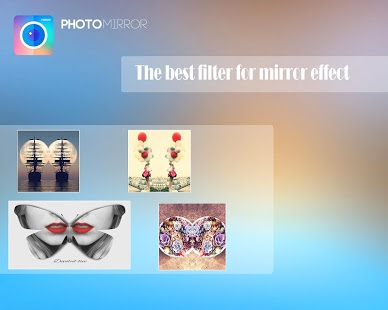 PhotoMirror also let you enjoy other value added features like filters, borders, rotios for the most dramatic effect. 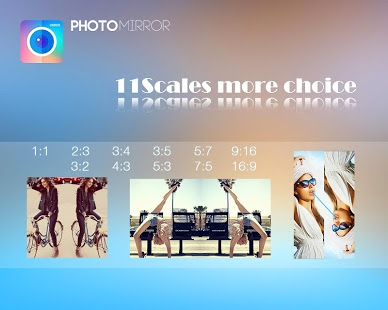 PhotoMirror Mirror & Collage photo or image, PhotoMirror is the best photo editor! Come on, and Enjoy it!PhotoMirror Photo Editor is everything that you would expect from a comprehensive photo editor. ï¼ Left right mirror, up down mirror, repeat 4, reflect 4 reflections, totally 17 mirror effects new Mirror Effect. ï¼ With Square photos or different ratioï¼High resolution results. ï¼ Tens 3D mirror designed effects, with heart, love, leaf an so on. 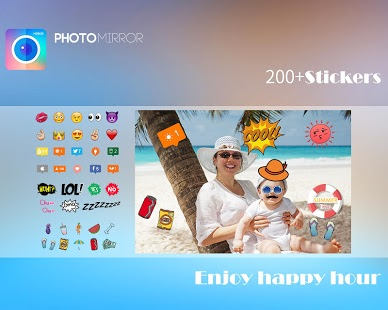 ï¼ Twenty memento mirror designed effects, with pip, color filter, love, meet 2015 and so on effete. ï¼ Almost hundred collage effects, with 3D effect, line effects, record every wonderful moments of you life. ï¼ Tens unique filters effects with lomoãHDRï¼ brightãblueãwater and Vignette filters! ï¼ Tens of fancy borders and frames. ï¼ rotate/reverse/zoom in/zoom out/ to selected photo,the mirror photo will be changedãyou also can manipulate pic by finger. ï¼ Easy to share to Facebook, Twitter, Intagram, Tumblr, Whatup, Line, WeChat and Mail, To get more like or get more laugh! Now with the app PhotoMirror Photo Editor you can be the expert photography editor and you will be able to create wonderful photos. Any suggestion please mail: [email protected] , we will contract you as sooner as possible. Come On, Join and Enjoy!